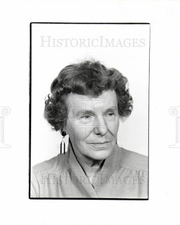 Ruth Beebe Hill was born in Cleveland, OH to Hermann C. and Flora M. Beebe during April, 1913. In 1935 she graduated with a B.A. from Western Reserve University and pursued graduate studies there in 1936-37. In 1939-40 Hill studied at the University of Colorado. In 1940 she married Burroughs Reid Hill; together they had one son, Reid. Hill currently resides in San Juan Island, WA.. She was first a member of the promotion department at Books and Authors, Inc., Los Angeles, CA (1949-1955), then a news and feature writer with the Newport-Balboa Press, Newport Beach, CA (1950-52). Hill also served as Co-founder of the Women's Auxiliary California Institute for Cancer Research. Throughout her life she has and continues to lecture at Universities and seminars across the country. In addition to her best selling novel Hanta Yo, she was the author of a monthly column for Western Life Magazine, 1967-68. In 1979 Hill received the Golden Plate Award from American Academy of Achievement. Hill was 66 at the time Hanta Yo was published by Doubleday (1979), although she began work on the thirty-year project beginning in 1951. From the time she was young she had a passion for Native Americans. From 1951-1954, Hill buried herself in local libraries preparing for her novel. She finally came to the conclusion that library research was not sufficient for her cause and left to travel Native American Reservations. She spoke with/interviewed over a thousand Native Americans. Her intention was to gain first hand experience in a Native American environment and she spent much of her time, not only speaking with the natives, but observing the land in order to absorb the influence on the culture. In a Smithsonian article she discussed her experiences and warned: "If you go with a camera and a notebook, you might as well not go. You can count on being turned over-like inquiring anthropologists-to the biggest liar around. You want a legend? You'll get a legend. And it's all crap!" Chunksa Yuha, a bilingual Native American musician, entered the project during the last fourteen years. Yuha assisted Hill in the discovery of the Native American "soul." She committed herself to learn the Native American language, Dakotah (Lakotah) with Yuha as her instructor. The fact that he had been withheld from "white schooling" as a youngster made him a valuable resource in her studies. He regurgitated information, some of which had been suppressed for as many as two hundred yeas. "Hanta Yo," meaning "clear the way" in Dakotah, tells the story of a small tribe of Teton Souix which resisted white influence during the time between 1750-1834. Hill's concern with the elimination and corruption of the Native American culture by the "white" conception of America is the dominant pretext for this story. Hanta Yo, Hill's only book, is more a life work than a novel. Her desire produce this text obviously emerged from a sincere passion rather than a desire for success and recognition. Ruth Beebe Hill is currently considered a "single author." If one or more works are by a distinct, homonymous authors, go ahead and split the author. Ruth Beebe Hill is composed of 2 names. You can examine and separate out names.